Kyle and Owen love, love, love these books. Of all the chapter book series I’ve read to/with them, this series is my personal favorite. If I were making my own Top Five list, these would definitely be #1 on the list. I’ll go ahead and make a bold statement here, and I will stand behind it 100%: I think that the children’s section of every library in the country — and definitely every school library — should have this collection. They are amazing books. I just can’t say enough about them. I have come to admire the author, Sharon Draper, in a big, big way (her numerous well-deserved awards and accolades are amazing! ), and I can’t wait until Kyle and Owen are old enough to start reading all of her books for teens (check out her website at http://sharondraper.com/books.asp). This is a stellar series! If you read them, you’ll see exactly what I mean! I LOVE Sharon Draper! I’ve read Copper Sun, Romiette and Julio, The Battle of Jericho, and November Blues. She is an amazing author!! I also LOVE, LOVE Sharon Draper. 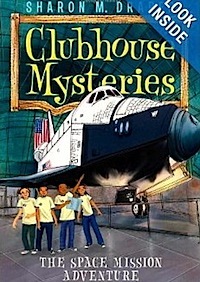 I started a literary club for my son and 9 of his friends several years ago when they were 8 and 9 years old. 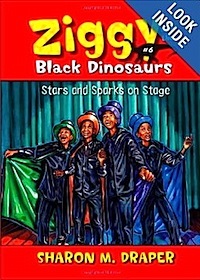 They read the Ziggy series as a group and THOROUGHLY ENJOYED each one. We hosted conversations about each book at a local book store, and even had trips to culminate the completion of each title. 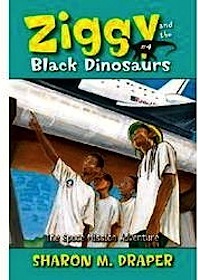 The boys were enriched greatly by the writing and WONDERFULLY historical and educational story lines. Most excellent! I am so hurt about the covers! I know…it is the game. But, I wonder what my son and his friends will think of this. I don’t even think they would have been interested enough to read the books had these new covers been the originals. The “old” character imagery had much more “flavor” in my opinion! 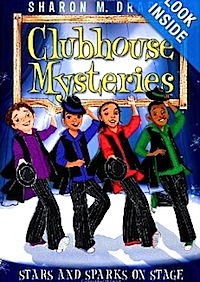 Lynda, I think it is awesome that you were able to start a literary club for your son and his friends. I am currently starting my own for my sons (7 and 8 years old), which is what led me to this post! I’d really love to pick your brain for guidance on the subject of a book club for boys. Please reply to this post, and I can send you my email. Thank you in advance!